Why to pay for ClashFarmer Professional? The professional version has additional awesome features and by purchasing it you're contributing and donating to ClashFarmer development and improvement. Please note, the FREE version will be always available and updated and it has everything you need for efficient botting. So you’ve decided to hop in and try it out. What does that entail? Download and install Clashfarmer. 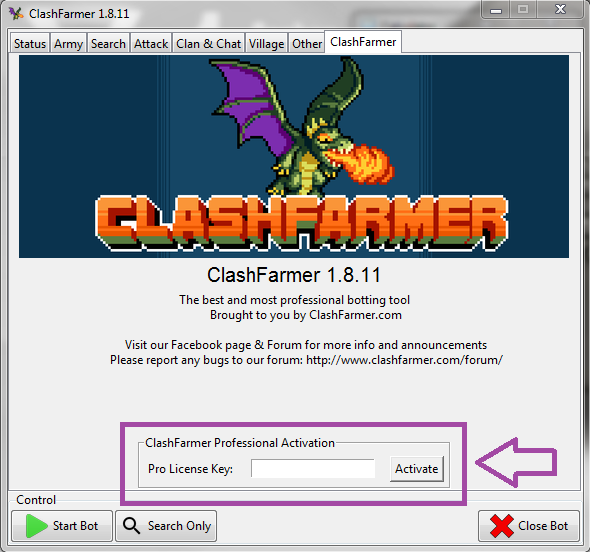 Check out our Clash of Clash Bot Tutorial for full and simple guide on how to set up ClashFarmer and android emulator (MEmu or BlueStacks). Choose the plan you wish to upgrade to and click "Buy Now". The Professional version license key will be sent to your Paypal email within a few minutes. If you haven't received your license key after more than an hour, please contact us by email. We accept PayPal, which is one of the world's largest Internet payment companies or payment via Bitcoin. For paying with bitcoin please contact us first at [email protected].